Professor Marta Erlandson (right) and kinesiology student leader Emmarae Dale (left) take a quick sponsored break during their turn on the bikes. Were you one of those kids who struggled to sit still in class? Were your teachers always frustrated by your constant fidgeting and disruptions? Imagine if there was a stationary bike available to help channel some of that excess energy and still allow you to be a part of the lesson. This new idea is spreading across the country and our Kinesiology Students’ Society is holding a terrific fundraiser to help make stationary bikes a reality in Saskatoon elementary school classrooms. Spark bikes are stationary bikes that promote active learning with a desk or surface built around them to allow students to read or write while biking. Some kids need a movement break more frequently to maintain their focus on task. Others find that physical activity helps them navigate and regulate their emotions. Through their studies in the mechanics of human movement, Kinesiology students recognize the importance of encouraging kids to benefit from physical activity and establish patterns of healthy choices as early in life as possible. 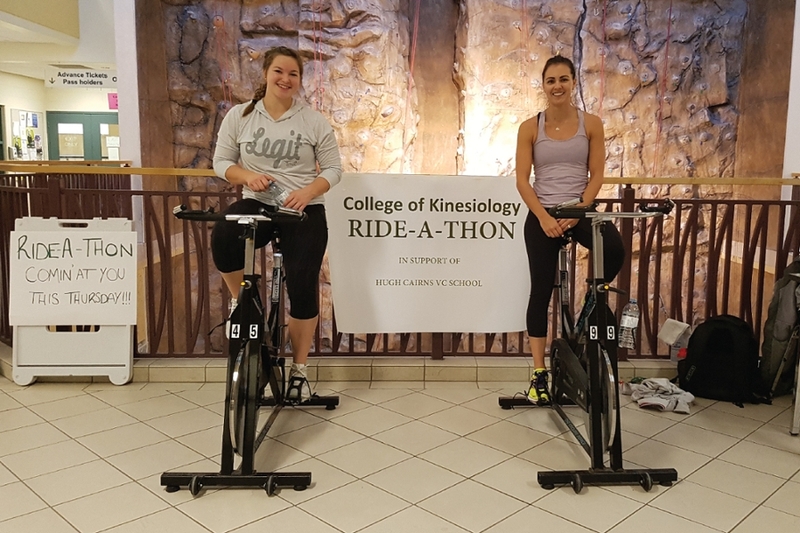 The Kinesiology Students’ Society is holding a fundraiser Ride-A-Thon on Thursday, December 1 from 9 am – 3 pm on the second floor of the PAC. Faculty and student council members will be riding stationary bikes for 30 minute slots. We encourage other members of the college and our campus to stop by and donate in support of the bikers. With a full menu of options to choose from, your donation can either challenge the biker (add an incline, make them hop off and do 10 burpees) or support them with water, a snack or a break. Proceeds will support the purchase of spark bikes for Hugh Cairns V.C. School. Please come out and support this great initiative! Watch them in action - Cary Primeau, Jon Farthing and Kim Jones are challenged with 10 pushups in the middle of their ride! A double round of stairs here at the PAC for Jon Farthing, Cary Primeau, Kim Jones, Shana McLean and our new dean, Chad London! Article re-posted on 2-Apr-2019 5:19:21 PM .